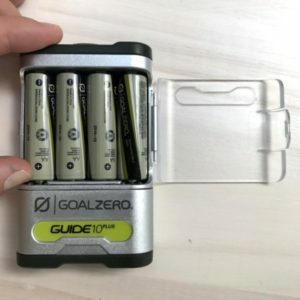 The Goal Zero Guide 10 Plus is a slightly overpriced AA + AAA battery recharger, but it’s actually pretty good for what it was made for. Despite some issues this product works great for it’s primary purpose, which is recharging AA batteries with solar power. However, this product does have some shortcomings which I will go over. What Does The Guide 10 Plus Do That Other Rechargers Don’t? 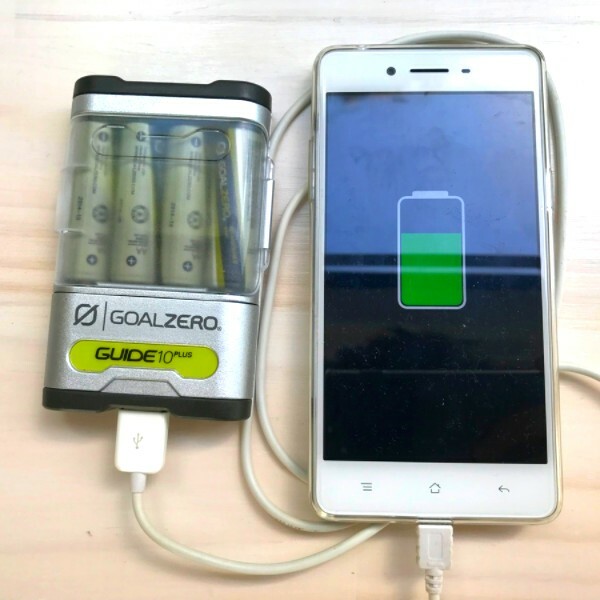 You can buy much cheaper battery rechargers than the Goal Zero Guide 10 Plus. In fact this Amazon Basics recharger is really good for less than half the price. But, the Guide 10 Plus does have some niche uses that make it worth purchasing for some people. Lots of other battery rechargers have the ability to also charge an external USB device, but with a catch, it has to be plugged into the wall while you’re doing it. The Guide 10 Plus can charge an external USB device WITHOUT having to be plugged into the wall. That’s right! It doubles as a AA + AAA battery recharger AND a power bank! Charge AA + AAA’s for your gadgets and if you don’t need them right away then you can use those batteries to actually charge your phone. The catch is that the Guide 10 Plus uses a 1 Amp charger (compared to the now way more common 2.4 Amp chargers) which means it is REALLY slow. So slow that if you’re using your phone for power hungry apps like Snapchat it’ll actually continue to go down in battery power while charging it. It also provides a pretty pitiful charge to the newer phones with larger batteries on the market. No chance of getting a full charge for an iPhone 7 Plus with this thing. Still, it’s useful in emergencies. 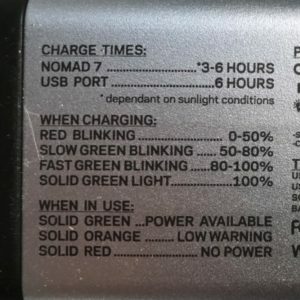 The Guide 10 Plus has both a USB input (so you can charge from the wall) as well as a solar panel input for the Nomad 7 Plus Solar Panels and the Nomad 13 Solar Panels. The funny thing is you can actually charge your batteries from the sun in half the time it takes to charge them from a wall outlet. The Nomad 7 Solar Panels are super light and portable solar panels that retail for $99.99. The panels can be laid on the ground in the sun or attached to items like your backpack to get sun and charge your batteries while you hike or go on your adventure. So combine the panels with the Guide 10 Plus and you’ve got the perfect solution to keep your devices charged using only the sun. 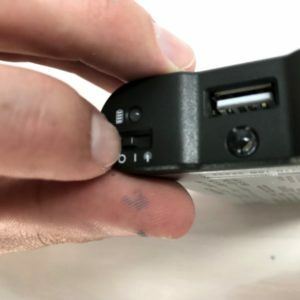 There are solar banks out there that can be charged from solar panels, but the Guide 10 Plus is the only device I could find that allows you to charge AA’s and AAA’s directly from solar panels. 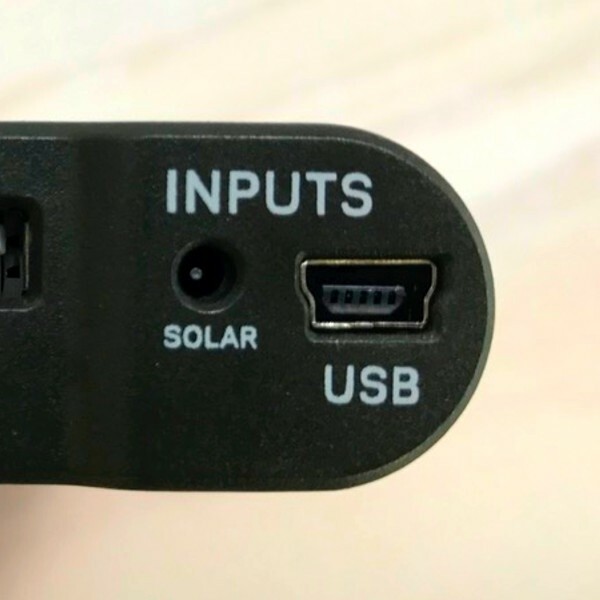 I guess you could get solar panels that output to USB and then get a device with the same Volt/Amp input that charges batteries. But you’d have to hunt for the right solution. I’d prefer to save my time and go with Goal Zero. The Amazon Basics Battery Recharger I mentioned earlier is great, but it isn’t rugged and it isn’t spash proof. 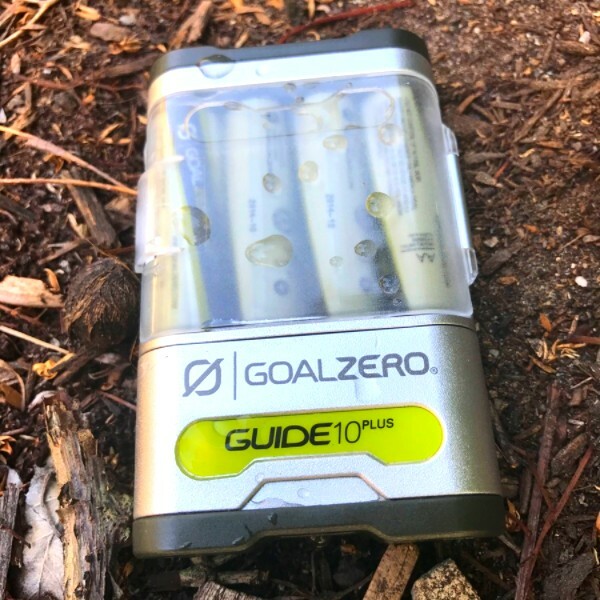 If you’re going to take your recharger on adventures where it might be bumped around a bit in your bag, or might get a bit wet then the Guide 10 Plus will serve you well. 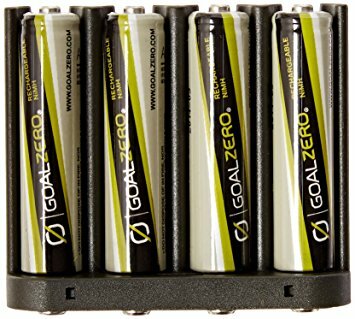 Goal Zero seem to overengineer all their products (to the point where people literally take Goal Zero gear all the way up to Mount Everest base camp ). Goal Zero stuff is made to handle some pretty serious conditions and the Guide 10 Plus is no exception. This results in a product you can drop, leave out in light rain or even lend it to your kids and it will still work fine. So if you’re rough and tuff with your gear like Casey Neistat then you’ll go through other battery rechargers like tic tacs. Chances are it’d be cheaper and easier to get the Guide 10 Plus recharger instead because it’ll outlast all the others. NOTE: Will only charge with 4 batteries inserted. Will not charge with less than 4 batteries inserted. 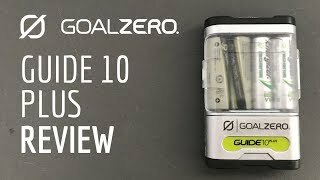 The Guide 10 Plus retails for $39.99 on Goal Zero’s website. It comes with the charger, 4 x AA batteries, AAA insert and mini-usb chord. The Guide 10 Plus isn’t without problems or annoyances. It isn’t a perfect product by any stretch of the imagination. Here are some of the issues I have with it (or problems I think you’ll want to know about). AAA batteries require a separate insert – By default the Guide 10 Plus charges AA batteries which is great. It also charges AAA batteries but here’s the catch, it requires a separate insert. This is frustrating because other rechargers have the ability to charge AA’s and AAA’s simultaneously without inserts. There is also nowhere to store the insert if you’re using the device to charge AA’s so it can get lost easily. UPDATE: I tried to find my AAA insert to take a photo for this review and yup, I’ve totally lost it. 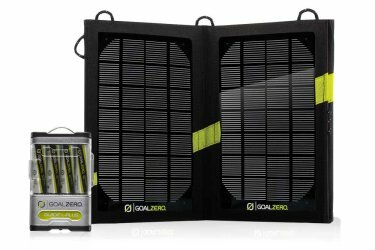 It’s not a huge problem with the device, but given how well Goal Zero designs their other products (eg. The LightHouse Mini) this is disappointing. Input is Mini-USB not Micro – The Guide 10 Plus comes with a mini-usb cable for charging (no wall charger is provided). Most devices these days use micro-usb as mini-usb is an older technology. This means when I misplace my Goal Zero chord (which…yes I have already lost it) I have 100 micro-usb cables lying around my house and zero mini-usb cables. 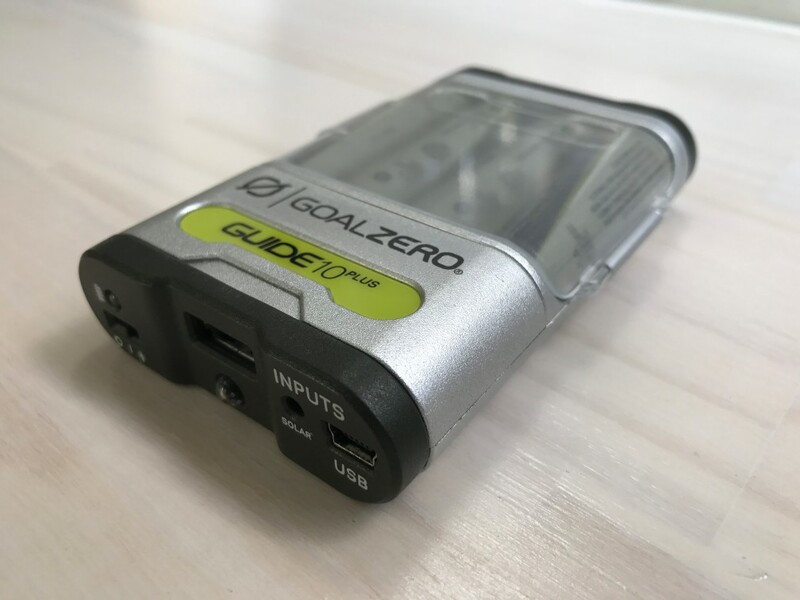 I wish this had a permanently attached USB cable, or flip out USB input like other Goal Zero product, so I never had to worry about finding cables to charge my batteries…ever. Batteries are hard to get out by hand – The batteries are easy to put in but hard to get out unless you have really long and strong fingernails. You need a knife or something similar to pry out the first battery, then the rest come out fine. Output is only 1A so charging is slow – The output when charging external USB devices is 5V and 1A. Compared to 5V and 2.4A of many chargers today. This means that charging newer phones and tablets is slow going, like so slow if I’m charging my phone and using a power hungry app like Snapchat my battery will still go down (albeit very very slowly). Battery level indicator is confusing – There is 1 LED light to indicate how much battery you have remaining. It’s uses a mixtures of colors and blinking/solid light to indicate what’s going on. I can NEVER remember what fast green blinking light means compared to a slow green blinking light. Luckily there is a guide on the back to help you decipher the LED code but it’s annoying. My solution: Ignore the light and hope for the best. Trying to work it out is too much effort! Turning on external USB charging is finicky – There is a teeny tiny switch on the Guide 10 Plus which has 3 positions. Off, On (charges external devices) and Light. You’ve got to use your fingernail to move the switch. Off and Light are located on either end and thus easy to get to. On is inconveniently located in the middle and if you’re not careful you’ll go past it and shine yourself in the eye with the bright LED torch (which I have done on multiple occasions). You have to be gentle with it to get it into the on position. 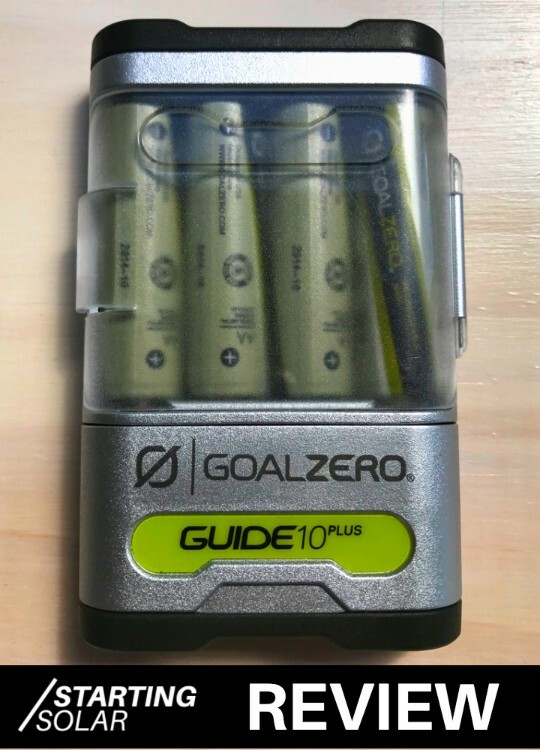 As I stated at the beginning the Guide 10 Plus really is an overpriced battery recharger and if all you want it to do is charge batteries from your wall at home there are better and cheaper options available. If you say “yes I need that” to any of the above points then the Guide 10 Plus is the perfect product for you. In fact I would go as far to say if you said yes to the above criteria you are unlikely to find any product apart from the Guide 10 Plus that will suit your needs. The Guide 10 Plus retails for $39.99 and I think it’s absolutely worth the cost, especially considering it comes with 4 x AA batteries. It’s usually cheaper on Amazon so check it out using the link below if you’re interested. Thanks for reading this Guide 10 Plus review and I hope it has helped you to start the solar powered life.